Environmental conservation efforts are building momentum in Chile. The government is involved in this initiative as well as NGO’s, grass roots community members, and other groups. It has wild rivers, thousands of miles of Pacific coastline and desert ecosystems. The government has put aside around twenty percent of this countries area as protected. This includes Parks, Reserves, and Monuments. One of these parks is Torres del Paine National Park in the Patagonia region. One of the national reserves is Los Flamencos National Reserve. Islotes de Puñihuil National Monument is home to two species of penguins found in Chile. The World Wildlife fund has been working with indigenous peoples to form The Mapu Lahual Indigenous Parks. This park is run by the native people. Involving the community is a great way to preserve local areas. The WWF is working on forming a marine protected area in the Gulf of Corcovado. Other international organizations, such as Greenpeace and the Nature Conservancy are also working in Chile to help preserve, protect and work towards sustainability. 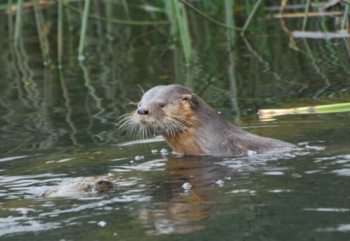 Below is an image from one of our Chile Eco Lodges-Tours featuring the Southern River Otter.